Here it is! 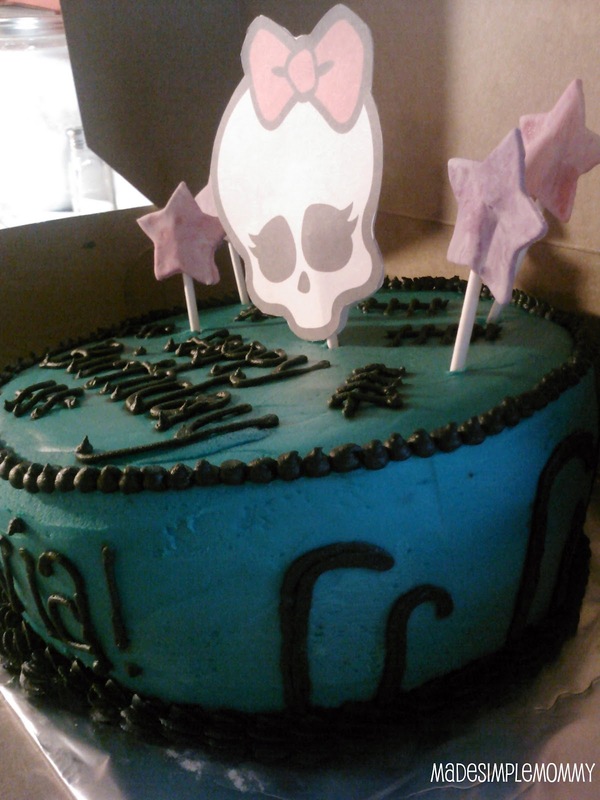 Another Monster High cake. 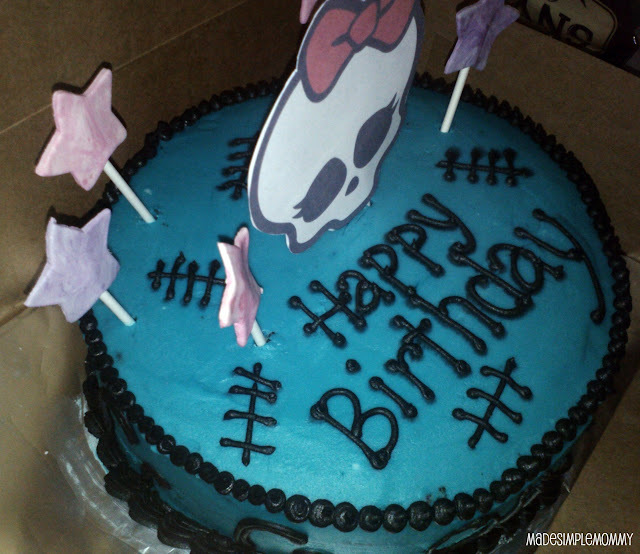 I also made a large batch of Monster High Skullette cake pops, which I will post the "how-to" on yet this weekend. This is a chocolate topsy turvy cake. I haven't made one yet, and I was going to buy the expensive set of baking pans to do so, but decided against it. I made two 8" chocolate cakes. I left one how it was, and I just sliced diagonally across the other chocolate cake. After it was sliced I fed the top half I cut off to the kiddos who were begging for cake, and then wrapped the other in saran wrap. I also wrapped the whole round cake also. I then placed each cake in its own large ziplock freezer bag and popped them in the freezer overnight. I froze them because I know it would help while frosting the sliced top to prevent crumbs from coming up and sticking all over the frosting. It worked! It is a simple design, I used a round #4 tip for the writing and the "stitches" on the top of the cake, as well as the dots around the top edge. A star #22 made the edging at the bottom. I had originally planned to attempt making the Skullette out of gum paste. But, I am an obvious newbie when it comes to working with gum paste, and I didn't add enough black coloring. If you haven't worked with gum paste before, the #1 tip I can think of "the color lightens, a lot as it dries". So the black was a light gray color and wasn't going to work at all. So I printed off a 4x6 photo of the Skullette onto card stock and glued it to another piece of card stock with a cake pop stick stuck in between. I did manage to keep the gum paste stars to stick into the cake. Using a small star cutter, I cut them out of the gum paste, and dabbed a bit of egg white onto the stick and let it dry to the back of the star. All-in-all it came out well. 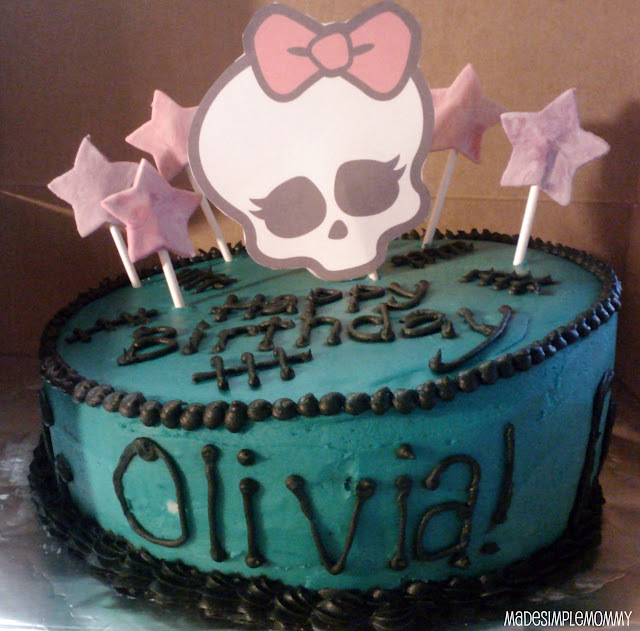 It is a simple Monster High cake, but it made the birthday girl very happy!